One of the great advantages of moving the code hosting in GNOME to GitLab is the ability to run per-project, per-branch, and per-merge request continuous integration pipelines. While we’ve had a CI pipeline for the whole of GNOME since 2012, it is limited to the master branch of everything, so it only helps catching build issues post-merge. Additionally, we haven’t been able to run test suites on Continuous since early 2016. Being able to run your test suite is, of course, great—assuming you do have a test suite, and you’re good at keeping it working; gating all merge requests on whether your CI pipeline passes or fails is incredibly powerful, as it not only keeps your from unknowingly merging broken code, but it also nudges you in the direction of never pushing commits to the master branch. 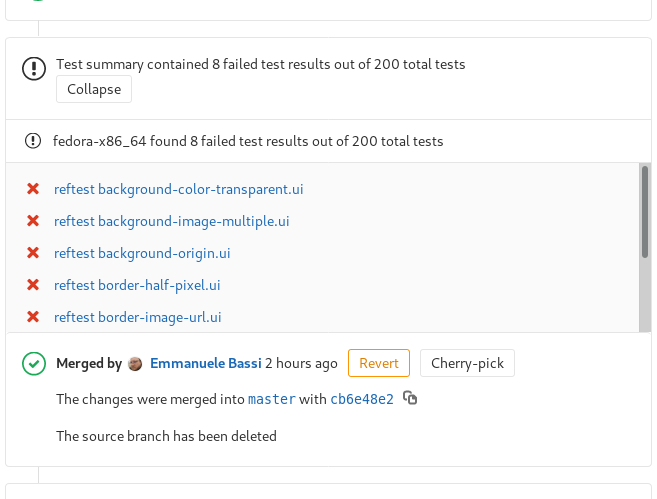 The downside is that it lacks nuance; if your test suite is composed of hundreds of tests you need a way to know at a glance which ones failed. Going through the job log is kind of crude, and it’s easy to miss things. Sadly, the XML format chosen by GitLab is the one generated by JUnit, and we aren’t really writing Java classes. The JUnit XML format is woefully underdocumented, with only an unofficial breakdown of the entities and structure available. On top of that, since JUnit’s XML format is undocumented, GitLab has its own quirks in how it parses it. Okay, assuming we have nailed down the output, how about the input? Since we’re using Meson on various projects, we can rely on machine parseable logs for the test suite log. Unfortunately, Meson currently outputs something that is not really valid JSON—you have to break the log into separate lines, and parse each line into a JSON object, which is somewhat less than optimal. Hopefully future versions of Meson will generate an actual JSON file, and reduce the overhead in the tooling consuming Meson files. And GitLab will store it for us, so that we can download it or view it in the web UI. All of this is, of course, not incredibly novel; nevertheless, the network effect of having a build system in Meson that lends itself to integration with additional tooling, and a code hosting infrastructure with native CI capabilities in GitLab, allows us to achieve really cool results with minimal glue code.